FDL Writers are kicking off a new year! Join us at Fennville District Library in Fennville, MI. Bring work to share, publishing questions, and paper & pen or your laptop. We'll be checking in on our 500-words-a-day challenge. Meets from 6-7:30 p.m. I'll be helping to facilitate the morning panel and breakout at this free, one-day conference hosted by Herrick District Library. Attendees will also be entered into a drawing to win a five page critique! Find more information on Herrick District Library's site. Looking for a writing group? Herrick can help you with that, too! Click here for their event calendar to see upcoming dates for their ongoing Monday and Tuesday night writing groups. Visit the Rochester Writers site for more information on this super-affordable day conference on writing for children and young adults. I'll be presenting a workshop on voice. Other presenters include agent Carrie Howland, fellow YA authors Heather Smith Meloche and Kristin Bartley Lenz, and more. Find the complete list of presentations for the Spring 2017 conference here. With the snow gone, writing groups are back! Young Adult Writers (tweens, teens, and those who write for them) will meet from 4-5:30 pm and Adult Writers meet from 6-7:30 pm. Both groups meet in the lower level of the Fennville District Library and include writing exercises & technique tips, critique time, and snacks. Groups are open to writers of all genres. It's time to kick off another year of writing programs! Teen (and tween) writers can join us in the lower level of Fennville District Library (400 W Main Street in Fennville, MI) for our Young Writers program from 4-5:30. The adult writing group follows from 6-7:30. Both groups include writing exercises, critique time, and snacks! Groups are open to writers of all genres. Fennville District Library - October 19, 2015 from 5:30-7 p.m. Teen writers: join me for the kick off of of Fennville District Library's teen writing program. Meet other teen writers, share your work, and explore ways to make your writing stronger. This program will run every other Monday into early December. I'll be speaking on two panels: "Giving Teens a Voice" at 10 a.m. and "Love and Longing" at 3 p.m. The Vegas Valley Book Festival has a great line up of authors scheduled. See their whole schedule at http://vegasvalleybookfestival.org/schedule/. Independent Bookstore Day: Young Adult Author Panel - May 2, 2015 at 2 p.m.
Each of Michigan's Schuler Books stores is hosting author panels featuring fantastic authors from the state of Michigan in honor of the first national Independent Bookstore Day! The young adult author panel at Eastwood in Lansing will feature Amy Rose Capetta, author of the space opera duology Entangled and Unmade; Cori McCarthy, author of The Color of Rain, celebrating the release of Breaking Sky, a taut, romantic, action-adventure novel; and Katie Van Ark, debut author of The Boy Next Door, published by Swoon Reads, MacMillan’s new crowd-sourced teen romance imprint. We’ll have goodies and giveaways, so save the date! Visit Schuler Books at 2820 Towne Center Blvd.Lansing, Michigan, 48912 at 2 p.m. on May 2. 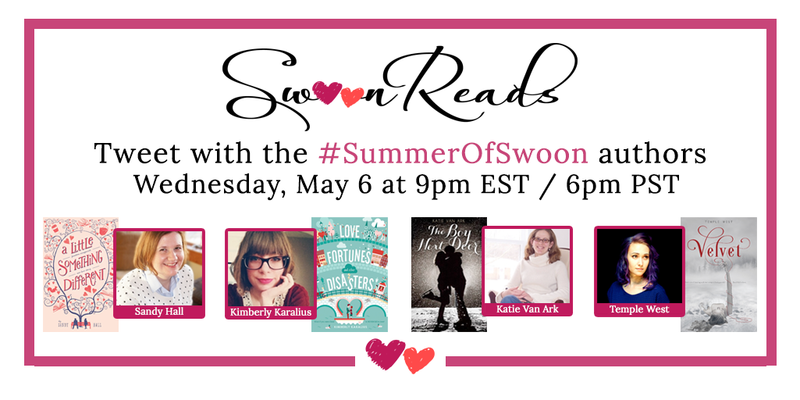 Join Sandy Hall (A LITTLE SOMETHING DIFFERENT), Kimberly Karalius (LOVE FORTUNES AND OTHER DISASTERS), Temple West (VELVET), and I for Q&A about our books and the upcoming #SummerOfSwoon tour. In May, I'll be traveling across the U.S. with three other Swoon authors: Sandy Hall (A Little Something Different and Signs Point to Yes), Temple West (Velvet), and Kimberly Karalius (Love Fortunes and Other Disasters). You can read the full announcement, along with a lovely interview with Temple, on USA Today. In addition to signings, the tour will include 10 word love stories, raffles, and celebratory treats. I'll be guest posting on several different blogs during the month of January. The bloggers have sent some great topics and questions so be sure to check them out! I'll be joining the Ottawa County- Grand Rapids WriMos for some National Novel Writing Month fun at the Holland, Michigan Barnes and Noble Starbucks on Tuesday, November 4, 2014 and Tuesday, November 18, 2014. (7:30 p.m. both times!) We'll also be at Cultureworks in Holland for the Day of Knockout Noveling from 11 a.m. to 5 p.m. on Sunday, November 16, 2014. UPDATE: I don't have a blank page in front of me but I've got one outside my window! Due to severe winter weather, I'll be writing along from home on Tuesday, November 18.